My mom has a green thumb that is unparalleled to anyone. This woman can honestly look at a plant and it’ll grow on the spot. It doesn’t matter if it’s from seed, seedling or a cutting. Our yard would bloom from Mary Boots, Tiger Lilies, heather to a willow tree. Gardening was a passion of my mom. You just had to see her face light up when she was working in the yard.. Fortunately some of that green thumb has passed on to me. My yard has two varieties of rose bushes, a peach color Camellia tree, and three varieties of azaleas just to name a few. On my small porch is Lily, my wandering Jew, Elephant ears and a few others. Like my mom it gives me a joy and a real sense of peace as my fingers work their way through the soil. 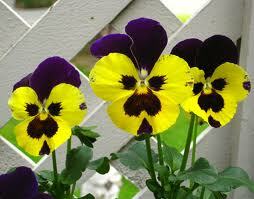 Unless of course I am working with pansies. The plant from hell that hates me with every fiber of its leaves and stem. I have tried to grow them from seeds, seedlings, cuttings to pots where they are already full grown and doing well. The end results is always certain death. This behooves me which makes my offspring laugh as I fuss non stop at this plant. The irony of this is I love pansies and all the amazing colors they come in. They just don’t like me. So until I can figure out what the deal is, I will enjoy them from afar. My family has been told on my grave site to not plant pansies for there would be no point. To which my son chimed in and said “ No, that is when they would make it.” as he smiled at me. The kid is probably right, they are waiting for their shining moment and that would be it. You’re lucky to have a green thumb. I have a certifiable brown thumb – it’s the need for watering plants where I usually fall short. And the 95 degree 100% humidity afternoons in the summer when I don’t really want to go outside. And the fact that I shudder at the thought of having to get up early on a Saturday or Sunday!